Usually I prepare for a speech a couple of days before the event. However, in this case I began thinking of what I should say the very day I received the invitation as I needed to make an impression on young professionals. From that day onwards, I worked on this, little by little. By work I mean I kept going through it in my mind. Today, I woke up at 5:45 and considered what I should say. I know many have talked about the people of this country and the kings of this country. But no one has talked about how many there were. I’m not sure if anyone has heard or written about this in books, but I’m not sure how many have considered how many have ruled during the 1000th century. I looked at the world population and how it has grown. I discovered that there were 275 million people in the year 1000. And then with 275 million people in the world, in 1871 Sri Lanka did a consensus which revealed that we had only 24 lakhs of people. So from 24 lakhs in 1871, when the British handed our country back to us in 1948, they had conducted a consensus in 1946. They counted 66 lakhs of people then. From 66 lakhs then to about 220 lakhs today, I wondered how this could be. Today, there is a world population of about 7.6 billion. In the year 1000, there were only 275 million. That means 3 to 4%. In about the year 1804 there was only about one billion. This became two billion in about 1927. From 1927 to today the number has grown to 7.6 billion. And so I realised that Lanka in the year 1000, that is 1018 years ago, there was a population between six and eight lakhs of people. This means that the building of our temples and ruins were all executed by these six to eight lakhs of people. In my mind I can justify this, because I know that the Anuradhapura and Polonnaruwa eras developed gradually in clusters. It is not stated anywhere that there were more people. So, it is these six to eight lakhs of people that did all this. When the steam engine was introduced in the 1800s, that is 200 years ago, people felt that because of it, their jobs were in jeopardy. At that time the population was only about one billion. In 1927 there was a population of two billion and it was in the 1990s that electricity was introduced. Then people thought their jobs might be in jeopardy and they were not very happy. But with the improvement of technology by man, man survives. But their instinct is fear when something new comes along. Now they’re afraid of developments in technology. They wonder if they will lose their jobs. No, that will not happen. What will happen is that man will convert technology into a service. When the steam engine came, the world progressed. Electricity came and the world grew. IT came and the world grew. So, there is no need to fear the future. I see the young professionals here, smiling. So I think that management is happiness. If everyone is happy, that is the result of good management. 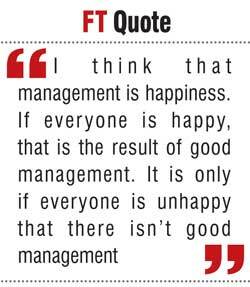 It is only if everyone is unhappy that there isn’t good management. When I look at a person’s face I can tell if he is a good manager. If he smiles all the time, it means he doesn’t have problems. That is a result of good management. So the ultimate test of management is if he’s happy. Some people bring their religion and race into work place. This is not right. Religion is personal belief. It should be something that is confined to the house. If they are brought into an organisation and if promotions depend on it, it becomes a cancer within the organisation. That’s why religion should be kept at home and not brought into an organisation. The language and practices of people are called culture. This too should not be brought into an organisation. These are personal things. In an organisation what we should consider is the intelligence of our people and not their religious beliefs or race. If these are the factors that affect decisions in an organisation, the person concerned does not practice good management. Then we must consider the environment around us. We must think of preserving nature. When we grow as a company we may want to cut some trees. If we have thought long-term and grown trees, we can cut some without guilt. That is, if we have grown 500 trees, we are without guilt. We should fear cutting trees when we haven’t grown even one in its place. So I ask all of you to plant whatever you can, wherever you can. In your home garden. Even in a land that does not belong to you. Because otherwise your sense of management will not progress. Take a country like Sri Lanka. In 1871, the population was 2.4 million. This is growing. With this growth we have a situation today where there are 360,000 births and 160,000 deaths; 220,000 get added to the population. That’s why they say that the growth rate of our population is 1%; 55,000 families get added to the population. So if we construct single-level houses for all of them, we will have to cut down our trees. Why? To construct a house if we need 10 or 20 perches, we will have to cut trees for land. And people who talk about the protection of the environment will have to address that. We talk about our environment and clean energy. Take clean energy. It should be affordable clean energy. For a country like ours, we should go for affordable clean energy. And the cleaner the energy, the more expensive it gets. How much can a country like Sri Lanka afford it? That’s why affordable clean energy is important. Take LNG, one of the cleanest forms of energy in the world. What is LNG? It is natural gas purified. It stands for Liquid Natural Gas. Where is it cleaned? Take a country like Australia. They manufacture LNG. They clean the gas. They get rid of sulphur, carbon dioxide, etc. and it’s brought here as clean energy. This is a natural gas that’s purified. It’s the same whether it’s cleaned here or there. But we purchase cleaned gas at the price we can ill-afford. Because it is cleaned in Australia. For example, Google and see ‘Australia – electricity generation by source’, you’ll find that Australia doesn’t have even 1% LNG. But Australia is the largest producer of LNG. That’s because even Australia cannot afford LNG. Then check Germany. Google ‘Germany – electricity generation by source’. They don’t have even 2%. Even the USA. Their manufacturing plants have a base requirement but don’t run at peak for 24 hours. Everyone talks about clean, clean, clean. The environment is the world’s environment, not just Sri Lanka’s environment. We must think of the whole world. For example, take an electric car that goes on the road. Why do people say electric cars are good, good, good? Its emissions are not good for the health of the population. Even to make it, electricity has to be generated at a coal or thermal plant somewhere. That’s where the gap is. If you take it as energy, you have to factor transformational loss as well. Why is it that they say every city must be green? Because of health issues. Because of the sulphur and carbon dioxide that is emitted. If you take the whole world, I don’t think that the affect is that dire. Take a coal plant in Sri Lanka built according to our affordability and situation. Take a coal plant in Germany built in the middle of the city. It’s clean coal. There are filters, etc. to prevent dust emissions. When we talk about a country, we must put it into context with other countries. If we make decisions without looking at what developed countries do, we will be in trouble. I ask all of you young professionals, before you make management decisions, look at what others are doing. Just like a country, the same principle applies to a company. If you’re getting a generator for a company, if you go for a petrol-run generator, your company might go bankrupt. So when you practice management, first see where you are, what kind of an environment you are in and study what others in a similar situation do before making a decision. I love and admire Albert Einstein. I studied about him and his life. I even visited his house in Berne, Switzerland, which is now made into a museum. I knew his brain was cut out and taken to America to the Florida State University after his death. I called them and asked for the professor who’s in charge of this. I was given the name Dr. Dean Falk. There was no point in living if I couldn’t understand this brain. I spoke to the doctor and invited her to come to Sri Lanka on a consultancy. She was too busy. I kept telling her I wanted learn about the brain. After a while she realised I wanted to know about Albert Einstein’s brain. 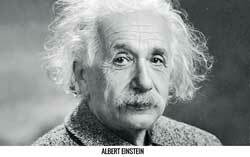 She shared with me some unpublished reports of 2009, 2012 and 2013 about Albert Einstein’s brain. Now I know what parts of this man’s brain are larger than others, which parts are denser, etc. ; that’s the level I go to. Most others would go to the web, read up on Albert Einstein and be done. That is merely information. Not knowledge. I could have done the same, but I dug deep. To me that’s success. If you love something that intensely that’s what you much do. Thailand get 26 million tourists and of those 12 million travel on budget airlines. I called the Thai Tourist Board and asked why they promote budget airlines. Their answer was that they have a few star class hotels, but the rest are budget hotels. Therefore it makes sense to cater to budget tourists. I called up Bookings.com. I asked how many hotels and rooms we had. Sri Lanka had 90,000 rooms with attached bathrooms where tourists could stay overnight. I then inquired how many of them were in the star category. There were 10,000 rooms above one-star. The other 80,000 belonged to small, non-star hotels. We’ve been trying to bring tourists from other flights into budget rooms. So I identified the problem. We were trying to cater to discerning tourist without offering them suitable accommodation. That’s why they don’t return. I looked at Malaysia. They too cater 50% to budget airlines. We can do the same and increase our two million tourists to four million easily. It’s a matter of catering to budget airlines. The Government, I believe, is looking into this positively. Today, everyone is also talking about the country. How to build a nation in which we can live in happily. Politicians have to consider how to keep the nation happy. 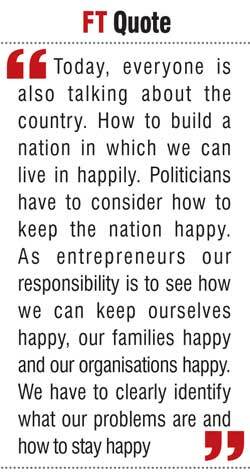 As entrepreneurs our responsibility is to see how we can keep ourselves happy, our families happy and our organisations happy. We have to clearly identify what our problems are and how to stay happy. We must look at our lives and see if we’re happy. We talk of others, our families, our organisations. But we don’t look at managing ourselves much. That’s why we must first look at managing ourselves. It is important. Even if we look at some professionals, we can see that they don’t manage themselves. We can see that even those who have great management experience don’t sometimes manage themselves. We don’t know how they apply themselves to other things. Let’s take managing the family. That’s about keeping your spouse, children, and if your parents live with you, how to keep them all happy. That is a great responsibility. Take a child. If the parents are rich, the child will have to take tuition in all subjects. The child is upset. Take a child from a poor family. There is no money for tuition. So the child is happy. But the child from the rich family is not happy. But then there is a reversal later. When the rich child is 24, he goes to a university abroad and is happy. The poor child at 24 becomes unhappy. So the child who is happy until the age of 24 becomes unhappy and vice-versa. How we balance this is of utmost importance. We talked about the steam engine, electricity and technology. We need to factor in technology into education from now. If a child is studying in Sinhala or Tamil, if we also familiarise him with English, it is easier for him to pick up technology. In the future larger-sized industries will play a big role. With the advent of technology and the utilisation of robots, everything will be large-scale. Small-scale manufacturing will be too expensive. Therefore, if we’re to ensure children are happy in the future, we must plan for it today. Otherwise the child will not be able to face the challenges of technology-based problems. In a family, it could be the wife or the husband, but they must consider how to live without creating problems and how to keep the family happy. If you have a good knowledge of how your husband or wife is, you must adapt to that accordingly. We know we cannot change it. If we build a house and decide it’s not good, we must still use it to the best of our ability. There’s no point breaking walls and changing it constantly. Because no one’s perfect. Even a couple is like that. I’m not perfect. My wife sometimes tells me that what I’m doing is not right. And I tell her to inform me loud and clear. Otherwise I won’t understand the gravity of what I’m doing. She tells me when she talks to me about thrice about one thing, I take it into consideration. That’s her way of managing me. She talks to me about something three times and then she sees me responding. Similarly, we must manage all problems around us. Without looking inwards, we tend to talk about the country or our organisation. If we keep ourselves and our family happy, we can them move onto keeping our organisation happy. 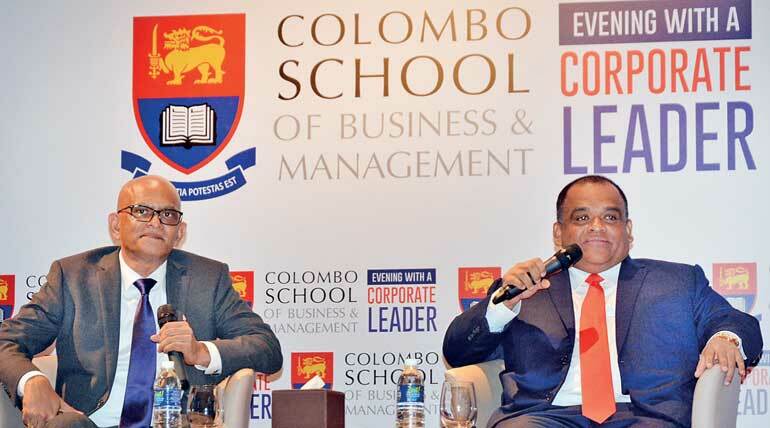 Biggest producers of LNG can't afford it, can Sri Lanka? We talk about our environment and clean energy. Take clean energy. It should be affordable clean energy. For a country like ours, we should go for affordable clean energy. And the cleaner the energy the more expensive it gets. How much can a country like Sri Lanka afford? That’s why affordable clean energy is important. Take LNG, one of the cleanest forms of energy in the world. What is LNG? It is natural gas purified. It stands for Liquid Natural Gas. Where is it cleaned? Take a country like Australia. They manufacture LNG. They clean the gas. They get rid of sulphur, carbon dioxide, etc. and it’s brought here as clean energy. This is a natural gas that’s purified. It’s the same whether it’s cleaned here or there. But we purchase cleaned gas at the price we can ill afford. Because it is cleaned in Australia. For example Google and see ‘Australia – electricity generation by source’, you’ll find that Australia doesn’t have even 1% LNG. But Australia is the largest producer of LNG. That’s because even Australia cannot afford LNG. Then check Germany. Google ‘Germany – electricity generation by source.’ They don’t have even 2%. Even the USA. Their manufacturing plants have a base requirement but don’t run at peak for 24 hours. Everyone talks about clean, clean, clean. The environment is the world’s environment, not just Sri Lanka’s environment. We must think of the whole world. In Colombo we see apartments coming up. Everyone laments that this affect the economy and it will bring down the market at point. I like seeing buildings coming up. Look at a city like Bangkok that houses so many apartment buildings. In fact, 60%ofhomes are apartments. Only the rest are houses. Look at Kuala Lumpur. There, 70% of homes are apartments. Let’s do the math here in Colombo. There are one million people. If one house has four people, we need 250,000 houses. How many buildings have approval for more than 10 apartments? 15,000. So only 6% of homes are here. Is this a big problem? As the per capita grows and we need more people in the city, we must develop more apartments. Let’s take your house. There might be a spot at the back of your house to manufacture concrete blocks. At 5 a.m. work starts and noise fills the air. So from 5 to 6 a.m. you lie in bed happy because your cement blocks are being manufactured. You enjoy the sound. What if it was your neighbour’s business? You would be angry. You’d go to the Police and try to stop it from happening. Why? Because it’s someone else’s noise. It’s the same noise but you react differently. That is management. Both are the same sound of cement blocks being manufactured. We accept one happily. The other we don’t. Once I was on a flight when a baby was crying. The stewardess apologised for the sound. I assured her it was alright because it was my child who was crying. She was surprised because the mother of the baby was seated next to her husband. But to me it was as if my child was crying. It didn’t disturb me. It’s how you perceive things. The stewardess asked me later why I said that. I explained it was a sound I couldn’t stop. So how can I be happy about the situation? By thinking it was my child. If I think it’s someone else’s child, I become unhappy. While travelling I have to decide if I want to be happy or unhappy. It’s a matter of perception. Your mind can control if you’re going to be happy or sad. Both are decided by you. So if you feel depressed at any time, you must ask yourself how to flip to the other side. It’s simple. It’s a matter of changing the way you think. Why are you sad? Is there a good reason why you’re sad? No. Now if someone is holding a knife to you and slowly plunging it in, then you have reason to be perturbed. But otherwise look at things objectively. You hurt when you accept the hurt. So don’t take the hurt in. If someone scolds you and you think it’s not relevant to you, don’t let your ear absorb it. Put it aside and smile. I can do this very well. I smile and say ‘is that so?’ That’s all it takes. When I inquired why, I learnt that they were like their grandmother who is a pensioned teacher. Both children want to be teachers. Their grandmother did Arts and now they want to do Arts. I spoke to the two daughters. They told me that their parents come home at 9 p.m. every day. They leave home by 7 a.m. in the morning. They spend time with their grandmother and want to be like her. They don’t like their parents’ jobs. Then I asked them if they would like to teach at Medical College. “Why don’t you become doctors and teach at Medical College?” They wanted to know if they could go home at about 3 p.m. I said, “Yes, if you’re a professor you could.” They left home agreeing to study Science. Today both of them are doctors. With every dilemma in your life, if you first think things through, you can find a solution. It’s the same with your children. Plan ahead for their future. There’s a family I know. Their daughter wanted to follow a certain path. When I questioned her, she revealed she wanted to study those subjects because her best friend was doing so. I explained she didn’t need to follow her best friend but needed to follow her heart. I showed her that she and her friend would go to different universities anyway. What is management? Is it how you manage an office? No. Firstly, can you manage yourself? A university teaches you how to manage a business. But first you must learn to manage yourself. If you cannot, how can you manage a business? So think about what I said today. 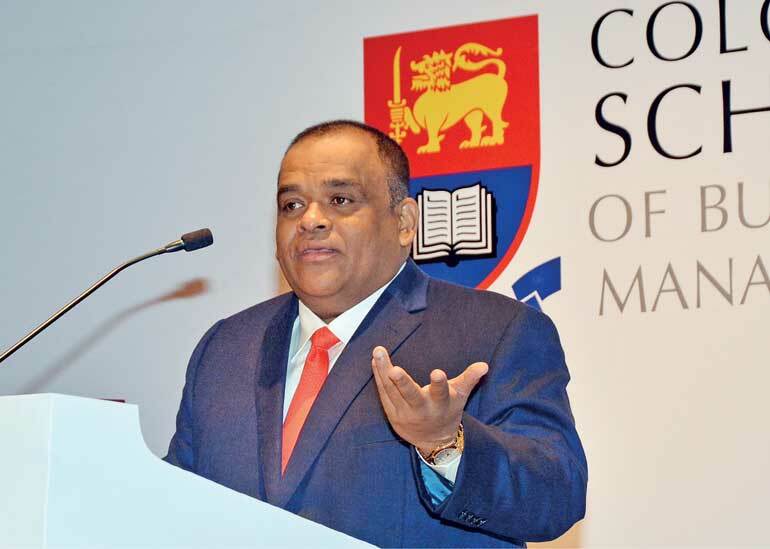 Remember what Mr. Dammika Perera told you. First, stop getting angry. There’s no point in anger. It leads nowhere. You just get caught up in it. I admit I get angry too. Then I try to stop myself. I possess that ability. If I take the anger home, I’m in trouble. So if I get angry in office, I attempt to get over it. Sometimes I need to show my anger if I’m with someone who lacks emotional intelligence. I’ll explain later what this means. Take Usain Bolt. He trained for 20 years. After all that he runs for 10 minutes. Even if he takes part in 50 races, it’s the same story. He runs for just 10 minutes. What do our people do? They run for 20 years after training for just 10 minutes. That’s why no one here can run. Why? Because they have trained for just 10 minutes, but run for 20 years. That’s the difference between us and Usain Bolt. Have you seen one of our people who has practiced for 20 years and run for 10 minutes? They have not trained so they cannot run. I make these points because I know people. I’ve managed so many people that I know what people are about as soon as I see them coming. Talking about family, those days my mother bought a leather ball and bat for me and my brothers and the kids in the opposite house. There was no guard for our legs or gloves for our hands. Only a ball and bat. My mother would sit to watch, with a bottle of oil for bruises. When I bowl, there’s one speed for my youngest brother and another speed for the slightly older one. Why? Because I know that if they get injured I’m done for. That’s the level of management training I got from my mother. There are some people in my organisation who cannot answer even a couple of big questions. So I ask simple questions, make them happy and send them off. This is management. If I ask them complex questions, they’ll have to go home. My staff understands this. They ask me sometimes what I just did. This is the training I received. I had to get my little brother out while bowling gently. But to the kids in the opposite house I would bowl more aggressively. It’s the same principle here. The same ball I send with greater or lesser speed for fear of damage. It’s how I manage my children and my company. Firstly, watch for anger. And when you make a mistake, find where you made the mistake. Some people think that they are too big for this. But that’s not right. If I make a mistake I want to know where in order to correct it. Even if it doesn’t impact me greatly I want to know where I fumbled because I want to correct it. If I cannot put myself through that, how can I move forward? 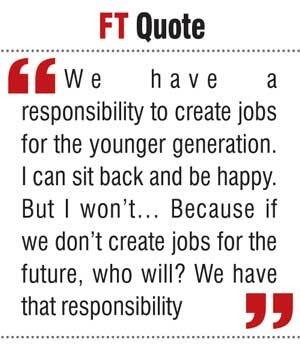 We have a responsibility to create jobs for the younger generation. I can sit back and be happy. But I won’t. I know that IT-based companies are moving forward. Take Hayleys. There are about 150 breakeven and loss-making companies that can provide jobs for about 15,000 young people. I keep looking at their business models to see how I can turn them around. If we run them on one shift, the capital expenditure goes for that. Can we run three shifts? Do we have the infrastructure to run three shifts? Can we provide transport, etc. for all? Some of these companies can be closed up tomorrow. But we won’t. We use them for research and development purposes. Because if we don’t create jobs for the future, who will? We have that responsibility. You might wonder why I worry so much. Otherwise what’s my job? There won’t be a job for me. So we must manage ourselves, our families, our companies and then move on to helping society. Let’s look at professionals, say an accountant. An accountant has a routine. Some accountants are happy to do just their routine. But in the future there will be machines for that. It’s up to him to plan for the future of the company, study the trends and introduce business intelligence to the company. Similarly, every person in every company has a routine. But they could be replaced in the future by machines. It is up to them to think emotionally how they can contribute to their company. Because if you put routine work into a chart, it amounts to data entry. Even a child can do that. The task of the top management is to think emotionally on how to take the company to the next level. You might think you can change companies. That’s not what I’m talking about. Even though every company has an owner and managing director, it takes team work to succeed. You cannot take a company 10 years into the future without planning for it. Let’s take an example. In the jungle there’s deer and a lion. The deer wakes up and wonders how to outrun the lion. The lion wakes up and wonders how to catch the slowest deer. He is lazy enough to want to work less towards it. The same applies to our company. If we’re slow our plight is the same as the slow deer. That’s why you must always think how you can take your company to the next level. 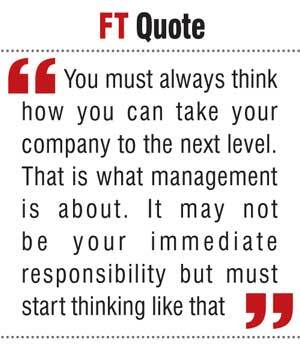 That is what management is about. It may not be your immediate responsibility but must start thinking like that. Here’s another example. There’s a girl I know, a relative, who works in a bank. She couldn’t understand why she hadn’t got a promotion in three years. She expected me to intercede and get her a promotion. So I asked her about business in the bank. She didn’t have a clue. I thought I should speak to her employers and ensure she doesn’t get a promotion. I asked her why she doesn’t know any of the things I asked. She answered it’s not her responsibility. Then I asked with whom she ate lunch. She said with others in the branch. I advised her to gently question them on how many deposits the bank handled, how much of it is loaned, etc. so you would know as much as a manager. I met her again 1½ years later. She looked happy and relaxed. When I asked how she was, she said she got that promotion. I wondered if she’d used my name to influence that decision. I asked the same questions as before. She knew everything. I realised she’d worked for it. It was not because of me. If you think you’ve not got a promotion, there might be a problem. Here’s another example. Again about someone who’s related to me. This person who works in the Government Pension Department told me he wants my help to switch to the private sector. When I asked why, I was told he cannot work there anymore. Everyone who retires comes there for their pension. He has to compile about 25 files a day which require 12 documents each and submit them. I inquired what the problem was since the 12 documents were not required by him but by the pensioners concerned. He said he had to explain this to each and every one who came there, which was tedious. I suggested he print out the requirements. But this, I was told, is not possible. Apparently he sometimes wrote the names of the documents on his palm sometimes. I explained that to compile 12 files a day he was already overpaid. I advised him to go to a typewriter and type out the names of the required documents. Then, he merely had to take photocopies of this and hand them over to everyone. He replied there was no photocopier in his department. His pay was about Rs. 40,000 or Rs. 45,000. I then asked if he had an ailment, whether he could afford to spend Rs. 1,000 every month. The reply was yes. So I suggested he spend Rs. 1,000 a month on photocopies, making sure two lists went into each page, so this could be cut into two to save paper. When I met him again about a year later, he told me he doesn’t have enough work. When questioned he said he now hands over a copy of the requirements and does not need to talk to the pensioners. Usually they have no means of living in the first month when they come to the department, so they’re depressed. This rubs off on him too. But now since he has less interaction with them, this is not the case. I asked if he still spends Rs. 1,000 on his photocopies. He said when his bosses saw this, they were ashamed and moved to buy a copier for the department. See that’s the choice you have to make. It’s the same even in the private sector. If you ask and ask for something from your company and don’t get it, are you going to be angry or spend a little of your own money and be happy? If we have to spend a little on medicine or a doctor, we are willing to do so. It’s all about how we think. 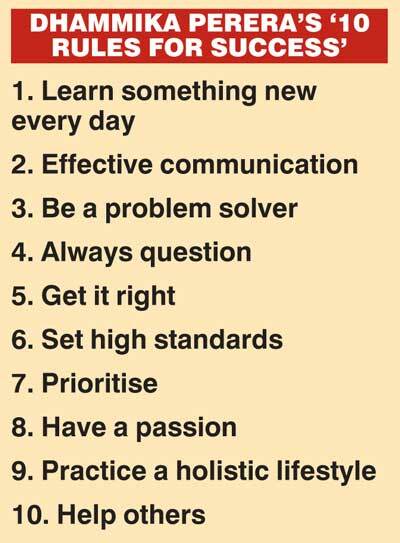 Now I like to share 10 rules for success. Some of you may be wondering what my success story is. I follow ‘My Ten Rules of Success’. Since knowledge is power, I always try to learn something new every day. I get a little sad by evening if I haven’t learnt anything new. I will tell you a story. There’s someone who does what I told you. That’s Albert Einstein. If you look at his quotes and what I do, there are lots of similarities. I love him because I’ve discovered that he and I think alike. So I studied about him and his life. I even visited his house in Berne, Switzerland, which is now made into a museum. He first worked in insurance because he couldn’t get a job. After selling insurance policies he was offered a job by the government to correct PHD research papers. It is during this period that he came up with his famous formula, because correcting these papers gave him the impetus to push himself. If you wonder if I merely visited Albert Einstein’s house, no. I knew his brain was cut out and taken to America to the Florida State University after his death. I called them and asked for the professor who’s in charge of this. I was given the name Dr. Dean Falk. There was no point in living if I couldn’t understand this brain. I spoke to the doctor and invited her to come to Sri Lanka on a consultancy. She was too busy. I kept telling her I wanted learn about the brain. After a while she realised I wanted to know about Albert Einstein’s brain. She shared with me some unpublished reports of 2009, 2012 and 2013 about Albert Einstein’s brain. Now I know which parts of this man’s brain are larger than others, which parts are denser, etc. ; that’s the level I go to. Most others would go to the web, read up on Albert Einstein and be done. That is merely information. Not knowledge. I could have done the same, but I dug deep. To me that’s success. If you love something that intensely that’s what you must do. Effective communication: Whenever I explain complex issues I simplify the problem so even a six-year-old can understand it. We must understand the communication skills of the person we are talking to in relation to us. Otherwise we will be communicating and not them. If I send an SMS and don’t get a reply I don’t know if the person on the other end has received it and understood it. So I cannot expect a result. If I at least get a thank you or yes or no, it means it’s reached. Some people send an SMS and wait for something to happen but it doesn’t. Some people send an email and expect it to be acted upon. Some people tell me they’ve sent an email. When I ask, did you get a thank you or ok in reply, they say no. Maybe the other party hasn’t even seen it. Sometimes people insist they sent an email and the other party insists they haven’t got it. This leads to arguments. When you send an email, call to follow up and make sure your communication is effective. Those who just grumble they haven’t received a reply don’t know how to communicate. Furthermore, if we don’t think about how this will have to be carried out by the other person, there won’t be a positive result. So when something fails twice or three times, you must find out the reason for it. If not, you’re not managing well. Those who don’t are aware they don’t manage things well. Once I was privy to such an argument about an email. The person on my side insisted he’d sent a mail on a certain day and time. I told him to apologise, even though I knew he was in the right, and offer to resend the mail. In five minutes he’d got a reply and everything moved forward. The point was not whether or not the email was sent. The job wasn’t done. If we argue over an email or SMS, we’re losing sight of the job and passing the responsibility on to others. Be a problem solver: I look at the big problem and see how it can be broken into smaller parts for which solutions are already available. Recently we acquired Singer. When I acquire companies I usually invite other shareholders to invest. An American buyer cautioned me because Amazon, Ebay, Alibaba, etc. are online. This has stores when the future is online. I took his advice but I probed further. I learnt that even Amazon was buying stores to keep up with orders. So I said, ‘Is that so?’ but that didn’t prevent me from acquiring Singer. What was the solution? Online. I realised it was necessary to improve online business. Today, after five months I see a 600% growth in online sales from last year. This year we should become No. 2 and by next year becoming No. 1, it will not be impossible. Then we become Sri Lanka’s No. 1 online shopping business. We also have the shops. Is that good or bad? If it’s raining I look at going over it or manufacturing an umbrella. That’s what a bird does. There’s no reason to fear challenges. In three or four months the work on Singer will be complete. Then I can concentrate on another challenge. Otherwise there’s no job for me. That’s why I don’t look at anything as a problem. Recently, I was consulted by the Government. I was told there’s a problem with the Tourist Board and asked what can be done. Only two million tourists were arriving. I looked at what other countries were doing. My company has its own hotels, but my personal involvement is less. I looked at Thailand. They have 26 million tourists coming in; 12 million travel on budget airlines. I called the Thai Tourist Board and asked why they promote budget airlines. Their answer was that they have a few star class hotels, but the rest are budget hotels. Therefore it makes sense to cater to budget tourists. I called up Bookings.com. I asked how many hotels and rooms we had. Sri Lanka had 90,000 rooms with attached bathrooms where tourists could stay overnight. I then inquired how many of them were in the star category. There were 10,000 rooms above one-star. The other 80,000 belonged to small, non-star hotels. We’ve been trying to bring tourists from other flights into budget rooms. So I identified the problem. We were trying to cater to discerning tourists without offering them suitable accommodation. That’s why they don’t return. I looked at Malaysia. They too cater 50% to budget airlines. We can do the same and increase our two million tourists to four million easily. It’s a matter of catering to budget airlines. The Government, I believe, is looking into this positively. I’ll share another big problem. When I worked in the Transport Ministry, 10 elephants would die annually by colliding with trains. I loved elephants and wondered how to overcome this problem. I spoke to university personnel and people from the Wildlife Department. I learnt that the largest contributing factor was that the horn of the train and the hearing of elephants were on different frequencies. I then consulted the train drivers who were responsible for the deaths. I talked to them about changing the horn. They couldn’t relate to my theory. So I asked them why they think this happens. They told me it’s only during a certain season when they don’t have water that elephants cross the tracks for water. Furthermore, the problem was confined to 20 kilometres. When I probed about times, I was told that during the day, they can see the elephants. It’s during the night time that problem is most prevalent. However, if someone, even a human, jumps across suddenly, there’s nothing they can do. We attached thermal heat sensor cameras to the trains courtesy of Dialog. We slowed the speed of trains in this area and placed an officer from the Wildlife Department in the front. All this was necessary only during the drought season. During the last five years there has been no record of elephants being hit by trains. This is a big problem, broken down to small portions and sorted out. Let me tell you something else. Apartments. In Colombo we see apartments coming up. Everyone laments that this affect the economy and it will bring down the market. I like seeing buildings coming up. Look at a city like Bangkok that houses so many apartment buildings. In fact, 60% of homes are apartments. Only the rest are houses. Look at Kuala Lumpur. There, 70% of homes are apartments. Let’s do the math here in Colombo. There are one million people. If one house has four people, we need 250,000 houses. How many buildings have approval for more than 10 apartments? 15,000. So only 6% of homes are here. Is this a big problem? As the per capita grows and we need more people in the city, we must develop buildings. Finally, it’s the way we think that’s the problem. When we’re upset we must look at the reason why. There’s no other science to this. Everything I spoke to you about today is simple. There’s no baffling use of technology. Here’s another example. Floods. During the floods the employees of Hayleys Fabric couldn’t make it to work. I told my Hayleys Hydropower division to look into the reasons for the flood. This same problem was presented to me in another way in 1999. I was building a power station at Kahawatte. I made a wrong calculation. There was a 152 square kilometre catchment area. I did the calculation and it was wrong. There was 70% forest which I took into account when calculating rainfall. I realised only when the water started coming that if it were tea or rubber, the water flows easily. So water that should take two weeks through forests flowed in four or five hours. Also rocks obstructed the flow. This could be observed by studying Google maps. The other important factor was ensuring that flood water flowed to the sea. The opening from the river to the sea had to be the correct depth for this to happen correctly. If the estuary is not cut to the correct depth it would cause flooding. During the British rule, areas around the Kelani River were deemed low-lying areas. This was without modern technology. Now we have equipment called Watermaster which enables us to cut the estuary to the correct level. Someone needs to do the right calculation. That’s all. Have you observed that in developed countries other than big storms, there’s no issue with floods? Third world countries tend to do things without the right calculations. Only countries Bangladesh, India and Pakistan are subjected to this. Have you even heard of such things in Malaysia? My fourth point is always question. I always ask questions out of my desire to learn more. I always ask the relevant question and add more knowledge to my life. Never stop questioning. At meetings I’ve observed that no one asks or clarifies anything. They say good and leave. But to understand something better we must question. We don’t question to put someone in trouble. We question to learn. We must question accordingly. Get it right. Right time, right people, right direction and right place are important factors to me, especially when starting new projects. If we want something done tomorrow morning, why do we tell the person concerned today? Chances are he might forget. Why don’t we keep it in mind and tell him tomorrow morning? If someone wants me to do something for him and calls me now, I won’t even take it in. And people tend to forget. Set high standards: My recipe for success is to raise the bar continually whenever I reach my goals, setting the benchmark for the industry. If we don’t raise our standards, we stagnate. If a company doesn’t raise its goals and improve its profitability, human resources, etc. there’s no future. Otherwise it will meet the same fate as the slow deer. Moving fast is management. Prioritise: Prioritising work is another aspect of my daily routine. I identify the most important tasks and work on those. I focus on activities that drive greater results and disregard the rest. If you don’t prioritise, work will pile up and you won’t be able to complete anything properly. Management is doing what’s important without grumbling that there’s too much to do. Don’t take on more than you need to. Delegate for efficiency. Have a passion: I love my work. Since I love what I do, I’m more eager to learn and work becomes a source of enjoyment. If someone says, ‘I’ve worked so much I need to take two weeks off,’ it shows that that person hasn’t managed himself. Yes, you need to enjoy holidays with your family. But see where you are most of the time and stay awake. For five days you’re in the office. If you cannot enjoy yourself there, where can you enjoy yourself? For that you need emotional intelligence. It’s nurtured when you’ve done sports, art or music. Some people are intelligent. But that’s the part that machines can take over. It’s emotional intelligence that will reign in the future. It’s the difference between man and machine. That’s why companies ask people if they’ve done music at Grade 8, to see if there’s room to improve emotional intelligence. Therefore in our education although we stress on exams, which is important, if we don’t teach art, music and sport, the child will have a difficult future. Practice a holistic lifestyle: We work the employees’ physical, psychological and spiritual wellbeing through psychotherapy and counselling programmes. We actually conduct such programmes at Lanka Tiles to see how we can keep our staff happy. We conducted a pilot project and we’ve got successful results. Help others: I reach out to those who are in need. I touch the lives of many through my charity work. Last year we looked at the IBM Watson programme for detecting cancer. That programme is still ongoing. For this we’re working closely with doctors in the Cancer Hospital. I personally worked with two patients right through treatment until they got better. This is to understand what cancer really is and be knowledgeable about the system if I’m to recommend it. We’re in the process of streamlining reports, etc. for a better second opinion. Talking about charity work, in 2000 I had called on my hydropower team to plant one million trees in 10 years. I entrusted a young engineer who is now a CEO with this task. Recently he told me that he has planted half a million trees through the country in the last 10 years. Now if I have to cut down a few trees, I don’t feel bad. I’m confident I’ve planted a million trees. The man who hasn’t will feel guilty for cutting down a tree all his life. I’d like to share something a Malaysian Prime Minister said in reply to a British leader who accused him of cutting down trees. He said, “I’ve only cut down trees I’ve grown. So I don’t have to worry.” That’s what I mean by loving the environment; not cutting trees but growing them. Furthermore, our companies got together last year and upgraded 500 preschools by donating 11,000 chairs, toys, painting walls, etc. and our group is committed to helping hospitals with something like 400 beds, intensive care products, etc.